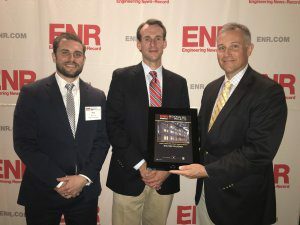 (SAVANNAH, GA) Engineering News-Record (ENR) has selected Felder & Associates, a Savannah architecture and design firm, and West Construction Co. to receive its Southeast Region Award of Merit for the Bouhan Falligant building at 1 West Park Ave. Considered the design and construction industry’s leading publication since the late 1800s, ENR is a weekly magazine that provides engineering and construction news. Felder served as the design firm for the structure that now anchors the south end of Savannah’s Forsyth Park and is the new home for Savannah’s oldest law firm. ENR recognized the $4.65 million project for being completed ahead of schedule in just nine months despite being impacted by Hurricane Matthew in 2016 during construction. ENR Southeast selects an independent group of judges to review submitted projects and determine final winners based on the size and scope of the project. This year’s judges reviewed over 90 projects before selecting winners which also includes SunTrust Park (the new Atlanta Braves Stadium), the Clemson University Football Complex, and the University of South Carolina School of Law Building. West Construction Co. served as the Bouhan Falligant building project’s general contractor with Thomas and Hutton as the civil and structural engineer and Chatham Engineering as the MEP engineer, along with approximately 40 team members representing many trades and professions from across the local region. Working with Felder & Associates, this team helped deliver the project in a timely fashion. The awards were broken down by geographic region as well as by category. The team’s Award of Merit fell under the “Small Projects” category for construction projects under $10 million. Featuring Chicago-style architecture, the Bouhan Falligant building was completed one percent under budget and two weeks ahead of schedule.